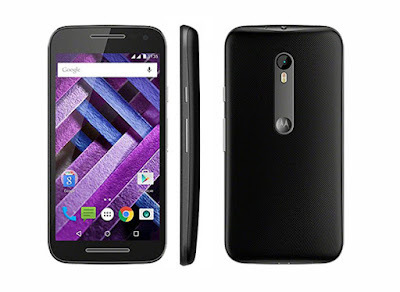 Moto G series is reason of having Motorola’s good share in Smartphone world, Moto G Turbo Edition is currently available a spec-philic mid range segment with some eye-catching key features like v5.1.1 Lollipop upgradable to v6.0 Marshmallow, 5.0 inches IPS LCD, 13 MP and 5 MP camera, Dual SIM support, 16 GB ROM with 32 GB of External SD card support, 2 GB RAM and 2470 mAh battery. The design is just copied from the Moto series Smartphone having curved back that is increasing its width from side to centre which is responsible for better gripping of the handset. Mobile is resistant to fresh water up to 3 feet for 30 minutes with IP67 certification. Placing of buttons as power button is placed on the right, volume rocker is right below. There's a secondary mic next to the 3.5mm audio socket and Micro-USB port on top. The visibility of 5.0 inches display is satisfactory although it is unable to deliver a crisp and vibrant output like the AMOLED display; that is relatively dull and appears slightly yellowish. There is nothing wrong in having 720p display that you can’t notice the pixels of the display and everything on the display looks neat and cleaner. Handset is accelerated by the Qualcomm Snapdragon 615 octa-core processor that confidently performs quite smooth and multitasking is liger free; Adreno 405 delivers pretty well graphics so phone can afford heavy games but battery heats up while playing games for longer time. Camera picture quality is top notch for people buying new Smartphone and in this mid ranger phone Motorola fixed a 13 MP primary camera and 5 MP front camera. Images from its 13 MP rear camera cannot be compared to high end phone but as according to its price group the camera captures decent photographs. From that primary camera you can also shoot 1080p full HD videos and 720p videos in slow-motion. There is good news about its battery supports quick charge that can charge your phone in 15 minutes and it will be usable for 6 hours. Battery is neither so wonderful nor so bad its average with backup of nearly one full day for an average user. USB OTG cable is supported. LTE is supported on both SIMs. Designed to withstand immersion in up to 3 feet of fresh water for up to 30 minutes with IP67 certification. 6 hours of power in just 15 minutes of charging. The Speaker Has High Bass. Camera Quality Is Not So Good. Battery backup is not impressive. Screen is not so vibrant- Low Colours, Low Contrast, Yellowish Screen. 1. The display is not so sharp and vibrant, 2. Its camera quality may disappoint the photo enthusiast people, 3. Battery doesn’t have a huge backup. These are some downside of this handset if you are fine with these little flaws the handset can be a good choice.